Remember the Milk is my choice online to-do web app. And so is true for many of you. If you are a RTM user, read on to find some goodies you could use for RTM. If you are not a RTM user, you could browse through a RTM review & a few posts here to see if that is something you’d like to start using. Here is a round-up of all things RTM. Enjoy! This awesome Firefox Greasemonkey Script adds a the RTM cow icon to Google Reader. Clicking on teh cow opens a RTM mobile window with the clicked links’ title, url for the post and a default tag (website) filled in for you. This would be perfect for bloggers who want to create a reminder in RTM to write about or link to specific post they are reading. It could also help folks who are researching and the possibilities are endless. This is definitely going into our Top Gmail & Google Reader Greasemonkey Scripts. RTM Tool for Windows does one thing and does it well. It lets you quickly add tasks to your RTM account via the utility that stays in your system tray. Love the support for a Windows Hotkey to quickly launch it. It’s a Remember the Milk interface for OS X and Dashbaord. Let’s you check off tasks as completed, add new tasks, tag management, lilst-bu-list view and filterings tasks by tag. Tasque is a Gnome utility that ties into RTM very nicely. I even have this running on my KDE desktop smoothly. 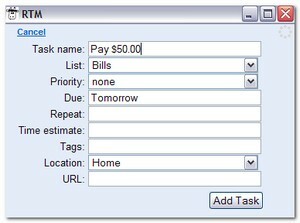 It lets you add and manage tasks although it lacks filtering by lists or tags. I do like how it shows the tasks based on date it’s due. Alternatively, you could use the iGoogle gadget version of RTM in Firefox sidebar as well. or you could even use the mobile or iPhone (need a Pro account) version of RTM for your sidebar but I prefer the Google Gadget version better. If you are a Gmail user, you probably can’t live without some kind of Gmail Notifier. Now, you can have the same for Remember the Milk tasks. 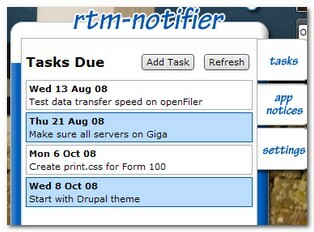 RTM Notifier is an Adobe AIR app that displays popup alerts for due tasks. If you use Thunderbird and Lightining, RTM Provider is the extension for you to integrate RTM with Thunderbird. Check out Daily Gyan‘s post on how to set this up. Another use of the iGoogle gadget for RTM is that you can RTM via the Active Desktop. Third Error has the details on how to do this. This is great if you don’t care hiding atleast part of your desktop wallpaper. This isn’t new, but you have to have this in a list about RTM. This Firefox extension integrates RTM into Gmail beautifully and IMHO has been done better than if Google had done it. A must have if you use the killer combination of Gmail, RTM & Firefox. A lesser known counterpart – a bookmarklet to quickly add tasks to RTM right from your browser. Don’t forget to watch this demo to make the most of it. In the above link, go one step above to find bookmarklets for other browsers. Ubiquity is for Firefox where Launchy is for Windows. You can control RTM with Ubiquity as well like there isn’t enough ways to control RTM. But, the command line auto-completion and the ability to quickly add and interact with tasks in Ubiquity is just plain awesome. And geeky. Gmail Labs introduced Gmail gadgets a while back. You can run RTM in your Gmail sidebar and access it while checking your email! Very cool. Just add this URL in gadgets setting to get RTM in Gmail. Great tools buddy, I love RTM to the core. Stumbled. Funny that you mentioned Launchy because you forgot RTM for Launchy itself. It’s a workaround that goes through Twitter at the same time so you get RTM to notify you through Twitter…all from your Launchy. Sweet roundup! I’m a huge RTM fan. The coolest thing is all these extra tools for it. Awesome. Great post, I had not seen RTM yet, it looks like it will come in handy many times over. My comment got eaten, twice. Thanks for the awesome info. I’ll let others know how helpful your blog is. Remember the milk it is absolutely great, have been using it for months now. Having added it to my IGoogle desktop has been an invaluable tool. RTM is great! I am glad you share the love! I did not know about RTM till now. It is a bit different. Any how thanks for sharing your interest. I tried RTM a while ago. It is much easier for me to use now with the gmail firefox extension. It integrates beautifully into gmail and firefox. Thanks! Hi, I just blogged about how to use the new “Send To” feature in Google reader to send reminders to go back to interesting articles in Remember The Milk. You might find it interesting. .-= Steve Ollis´s last blog ..Introduction of Blackberry mobile phones Application Development =-. Remember the Milk can be a full time job to manage and an obsession to keep up and running.